In 1826, Jan Heinrich Andresen, son of Thomas Andresen and Thurke Peppen was born on the remote Danish (at that time) North Sea island of Fohr. At the age of 14, he boarded a small ship to go to America but when he arrived at Oporto he decided to stay there and start a new life.. Andresen displayed an astonishing capacity for work and thanks to his enterprising character he amassed a fortune and established respect in the community. In time he became the President of the Commercial Association of Oporto. He died in Lisboa in 1894. In 1942 the heirs of J.H. Andresen were confronted with an economic crisis. They decided to sell the business to a society led by Albino Pereira dos Santos, already a respected name in the Port wine business. Destiny seemed to have chosen another man of rare character to continue the 100-year-old business. The company remains one of the few totally family-owned Portuguese Port firms. Andresen is far from a known name for lovers of the classic Porto's. It is, therefore, a traditional family house that is miles away from the about commercialized Port houses that you can find at every corner of the world. In contrast, Andresen port is in the top 5 of the most reputed port houses where quality prevails. In 1826, Jan Heinrich Andresen, son of Thomas Andresen and Thurke Peppen was born on the Island of Föhr part of the German North Frisian Wadden Isles. At the age of 14, he boarded a small ship to go to America, but when he arrived at Oporto, he decided to stay there and started working as an apprentice-port trader. In 1845, Jann Hallett Andresen founded the Port house J. H. Andresen at the age of 19. Andresen displayed an astonishing capacity for work and thanks to his enterprising character he amassed a fortune and established respect in the community. In time he became the President of the Commercial Association of Oporto. He died in Lisboa in 1894. In 1942 the heirs of J.H. Andresen were confronted with an economic crisis. They decided to sell the business to Albino Pereira dos Santos, already a respected name in the Port wine business. Since 1962, his son Mário Ruy Flores dos Santos runs the daily management. He continues the family tradition to the present day, faithful to the house. 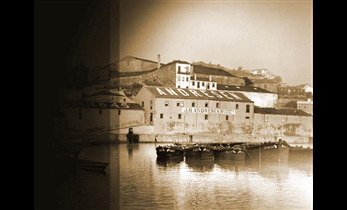 The company remains one of the few entirely family-owned Portuguese Port firms. All the port wines of the house are today produced in Quinta das Aranhas on the Tua River in the heart of Douro. The storage is done as legally prescribed in Vila Nova di Gaia. The 40 ha of vineyards are all of the highest quality (A-Rated). Visiting this quality house is impossible. You will only get in on appointment. Once invited, you will end up in the 19th-century atmosphere and hear the passion whisper as Andresen takes it all to a higher level!